CNG: Printed Auction CNG 75. MYSIA, Kyzikos. 5th-4th century BC. EL Stater (15.99 g). Sale: CNG 75, Lot: 340. Estimate $10000. Sold For $8100. This amount does not include the buyer’s fee. MYSIA, Kyzikos. 5th-4th century BC. EL Stater (15.99 g). 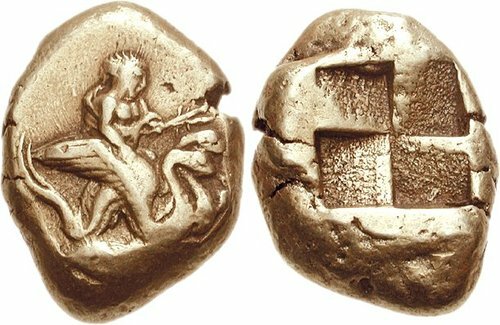 Triptolemos in chariot of winged serpents right / Quadripartite incuse square. Von Fritze I 163 (pl. V, 11 - same obv. die); SNG France 314. VF, lightly toned. Rare.